Ellie O'Brien (Peyton List) is struggling to juggle rhythmic gymnastics and troubles with her best friend. 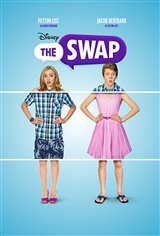 Meanwhile, classmate Jack Malloy (Jacob Bertrand) is trying to live up to his brother, who was a hockey star, and consequently, his father's high expectations and tough-love approach. When Ellie and Jack have an argument about whose life is more difficult, they trigger an inexplicable real-life swap. Ellie (as Jack) learns about brotherly bonding and hockey lingo, while Jack (as Ellie) has to decipher girl code and experiences a spa day. With a rhythmic gymnastics championship and a spot on the varsity hockey team on the line, they have to quickly figure out how to get back in their own bodies before the swap becomes permanent. As they're literally forced walk in each other's shoes, they gain empathy for one another and learn valuable lessons about their own lives. Canadian Connection : Filmed in Toronto, Ontario and Mississauga, Ontario. Several cast members are Canadian.